Thursday is GURPSDay. Last week, the Dungeon Fantasy Kickstarter ended, and wound up raising $176,000 through Kickstarter directly, and another $25-30,000 or so through direct W23 Sales. This opened up a couple of adventure modules, “eye in the pyramid” dice in the box, and three additional dedicated Pyramid issues. The “I want it all” level continued to grow in value, I believe surpassing $600. Those on the blog roll are already conspiring on content, I can tell you that. Below you can find the blog activity from the last seven days. Over the last week there have been 60 GURPS-related posts from our list of 66 blogs that have popped up on the radar screen as of 8pm. So it’s a great week. As always, if you’re interested in having your blog consolidated here, navigate over to The Instructions Page and drop me a line. Totally Not Lightsabers (10/06/16) -In this weeks GURPSday post I cover how to stat up your very own lightsabers…. I mean Force Swords. Brand Loyalty: Death-Blockers Ltd. (10/04/16) -Need the prospect of death blocked from your life? Then you need Death-Blockers Ltd. for all your armoring needs! Death-Blockers: Block Death. Look Good. Quick Note to GURPSDay Bloggers . . . (10/04/16) – If you blog for GURPSDay . 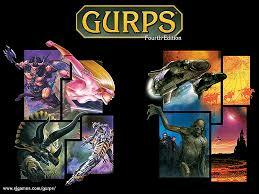 . . or want start, please do me a favor and email me at gurpsday@gmail.com. Please use GURPDay Mailing List in the title. Aeon Campaign S3E11 – Operation Viking (execution) (10/04/16) – The Aeon B-Team executes Operation Viking. It goes so spectacularly well (thanks perhaps to an inordinate number of critical successes?) that The Commander is suspicious that it’s a trap. We argue about this a lot. We also find some sort of weird funky vampire-looking thing sealed in a cryotube, in addition to the mission objective. Naturally we take both . . . and our plane crashes/gets shot down on exfiltration. Exclusive Dungeon Fantasy RPG Spell! (9/30/16) – An exclusive look at a new spell for the Dungeon Fantasy RPG Kickstarter… Land Mine! Perk: Named Possession (10/06/16) – Meandering notes on a controversial perk. Review: Pyramid #3/13 – Thaumatology (10/06/16) – A buncha exploratory applications of GURPS Thaumatology, and a cool template for Dungeon Fantasy. Sorcery: (Inspired By) Bulbasaur (10/05/16) – Some plant type attacks inspired by pokemon. Imbuement: Critical Charge (10/03/16) – The ability to more easily execute critical hits. Social Engineering: How to Negotiate Long Term Relationships (10/02/16) – Scouring the social rule books for a simplified list of mechanics to focus on for negotiating long term relationships. Opinions: Dungeon Fantasy 4-19 – Occupational Template (10/01/16) – Opinions on all the 250 point occupational templates in Dungeon Fantasy 4-19. Dungeon Fantasy: What Books Should I get If…? (9/30/16) – Lists of themes and books that can help expand Dungeon Fantasy in a particular direction, or any GURPS game in general. Session Recap: Until It Sleeps, Session 1 (9/30/16) – Breaking ground in the least graceful way. Grand Duchy 87 (10/06/16) – The Grey Company flees the temple, learn to ride lizards and reunite with an old friend. and Summary of the latest play session of The Grand Duchy of Adventure, our GURPS: Mystara campaign. Grand Duchy 86 (10/06/16) – Members of the Grey Company are introduced to 3 shadowy figures deep within the ruined temple. The Company prepares to battle for their lives against a horde of ghouls. Summary of the latest play session of The Grand Duchy of Adventure, our GURPS: Mystara campaign. Fire and Forget Undead in GURPS (10/06/16) – Rampaging zombie WMD? Madness Dossier ZIASUDRA Session 1 Notes (10/04/16) – Notes for the Maddness Dossier session on Sept. 18th. Psionic Styles (10/03/16) – A look at some psionic styles for Psi-Wars, including a discussion of deep-time prognostication, new Metabolism control techniques, and psionic witchcraft! Previous Previous post: Dragon Heresy and Grappling Heresy?